It was another successful afternoon for the underclassmen as the small school competed at Sunday's Auerbach Freshmen-Sophomore Meet. Tanner Jellison clocked one of top times for tenth-graders in the 1,000-meter run. 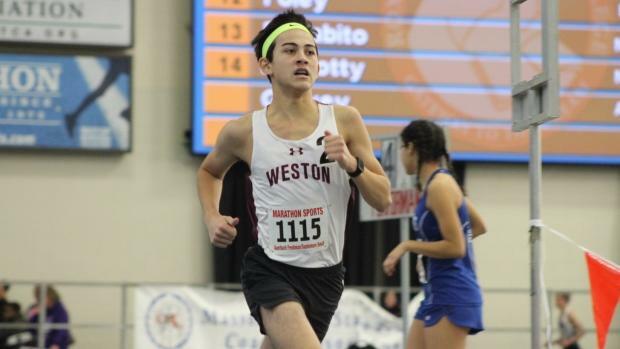 The Wakefield Memorial sophomore captured the event by nearly seven seconds with a winning effort of 2 minutes, 37.92 seconds, a time that ranks No. 3 on the list. In the girls' 1K, Mia Cromwell of Manchester Essex was first across the line at 3:11.99. The boys' mile turned into a hotly-contested race with less than a second separating the first four finishers. Ipswich's Jack DeMarco broke the tape in 4:48.27. He was followed across the line by Burlington's James Johnson (second, 4:49.93), Falmouth's Caleb Gartner (third, 4:48.93) and Milton's Francis Lalley (fourth, 4:49.11). 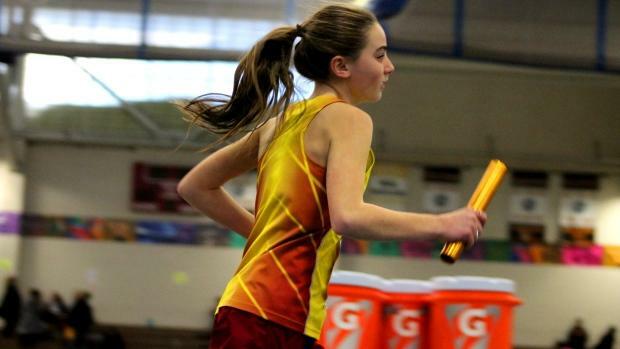 Bromfield's Tessa McClain won a tight race in the girls' mile with a time of 5:19.59. Seekonk's Abigail Teneiro was second in 5:20.57, while Millis's Bethany Steiner placed third in 5:20.58. Seekonk freshman Andrew Cabral was a narrow winner in the two-mile run. Cabral edged Wakefield's Matthew Roberto with a time of 10:10.72 to Roberto's 10:11.52 effort. Sydney Adams of Groton-Dunstable captured the girls' 2M with a time of 11:42.62. Norton's Isabella Pietrasiewicz was second at 11:49.42. Freshman Syeira Campbell of Pentucket slipped by Newburport's Olivia Sousa to claimed the 300m crown. Campbell was timed in 43.0. Sousa clocked 43.06. Junior Pontes Da Veiga of Amherst Pelham won the boys' title at 38.05. In the shot, it was Holliston's Cameron Connell (44-9.5) and Isabell Bergloff (32-10.5) that secured the crowns. Sophomore John McNeil of Medfield moved up to No. 1 in the state rankings in the high jump with a leap of 6-6. Bromfield's Samantha Scheonberg is No. 6 on the list with her winning height of 5-3 in the girls' vertical leap.